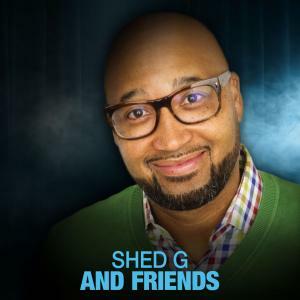 Meet Shed G, as one of the hottest and blessed entertainers to hail from Denver Colorado, Shedrick Garrett (Shed G) is a well renowned comedian, actor and radio personality known for his clean faith based comedy. Shed G brings a style of comedy that universally captivates audiences of all ages and races. In 2000, Shed G gained momentum by taking his talents to Atlanta where he earned his credits on the big screen. He worked alongside Tyler Perry in hit movies like Madea’s Family Reunion, A Madea’s Christmas ,Meet the Browns, & latest hit movie Madea’s Halloween. Shortly thereafter he was featured on hit TV shows like House Of Payne, Meet The Browns and The Rickey Smiley TV Show. Shed G has opened up stages for many music artists such as New Edition, Anthony David, S.O.S Band, Earth Wind and Fire, The Temptations, Brian McKnight, Marvin Sapp, and Lalah Hathaway. He has also opened for fellow comedian’s Ricky Smiley, Dave Chapelle, Ron Tripoli, Dave Coulier and & Kevin Hart. In 2012 Shed G moved to Minneapolis to pursue his dream of being a radio host/personality where he joined the Morning Show on 89.9 KMOJ FM making it one of the top Morning Shows in the Twin Cities. He Is now with Twin Cities newest station 105 The Vibe. Shed G & Friends Podcast is his next big venture who he teamed up with Miss Brit, Cool P, & Miguel Lloyd.